This topic may have already been covered. 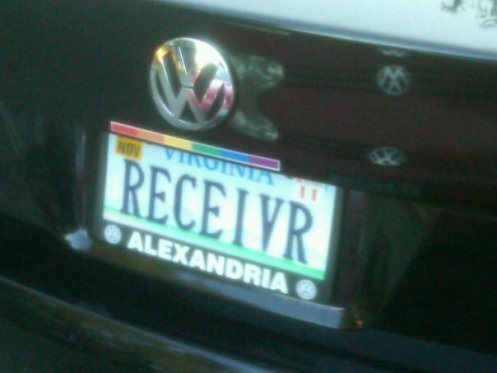 What vanity license plates do you have? My car has a plate that says, “MOSFETS” (not copying Steve). I also keep the Massachusetts plates that I drove down here with, hanging up on my desk at work as a reminder of reality. I have wanted such plates but to me they can attract the eyeballs of thieves, so I don't get the plates. Many of the NE guys had them. But after a while it felt like, "Yo junkies! I'm a ham! Got an expensive radio in here! Break my window and rip me off!" They are VERY rare on the road these days, especially with the high vanity fees of today. I tried to get HEAP or HIKER, but both are taken. CLASSE is available, but I didn't want to convey the wrong impression (like, I think I'm classy - HA HA HA ! NOT!!). MESSY is an accurate description. We are only permitted 6 characters here is Mass. 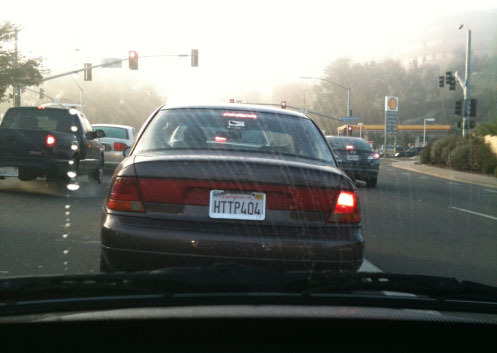 And anyone who knows HTTP (the web protocol), will recognize this error. An HTTP 404 typically means "not found". Ham plates in Arizona have 6 letters, but regular plates have 7. I wanted the “S” so I went with a regular plate. A ham plate might make more sense as people probably won’t get it otherwise. In CT, ham plates were $10. Today $45. I ditched mine when the CT money extortionists wanted more for them. In Georgia, Amateur plates used to cost a one-time fee of $25.00. Now the one-time fee is $45.00, and an annual fee of $25.00 in addition to the normal registration and tax costs. In addition to the theft risk previously discussed, there are also the identity and road rage issues in high-traffic areas. If people do not like the fact that you signaled and merged into "their" lane, it makes it very easy for them to track you down. I prefer to keep an anonymous low profile, except when turning up the wick. Am I strapping this guy? Anyway, there's a hamfest in Mesa tomorrow. My wife will be selling my junk while I aimlessly wander around looking for parts. We do this arrangement every time. Come one, come all! **Stupid spell correct! It corrected "hamfest" to "hamlet". I guess there are hamlets in Mesa... must be like little ham turds or something. I like mine so I remember it when checking into a hotel when they want your tag number. No mobile equipment in my car to steal. No extra annual fees in PA.
$10 annual in Ohio with proof. I gotta take a copy of my license in every year. You'd think they'd scan it and keep it in the database. But NOOOOOOO! Here in NY SSR, the tags age classified under Emergency Services. The required info and $$ must be mailed in. No online or walk into a DMV Office. I wish Connecticut would drop the “lightning bolt” symbol from amateur call sign plates. Looks goofy, especially in a 2x1 call sign plate like mine. It might be useful in faking out toll by camera scanners, reading my plate as AJ11G vice AJ1G, I have had people log it as such by hand on such things as temporary parking passes issued by guards/parking attendants. My one experience so far with toll by camera on the Mass Pike apparently did correctly read the plate though. Connecticut apparently does not require proof of amateur liscense on renewals of ham call sign plates. A friend’s mother’s car still had plates with her late husband’s call sign probably 20 years after he had gone SK! In TX are free along with many others. Plus you can have up to three sets for three different vehicles. In Minnesota we can have two. My truck is N0WEK and the car is N0WEK-1. People seem to think it's scandinavian and try to pronounce it. That's funny! Someone in Maine should get one that says A1YUH and have people pronounce that. And I checked. The callsign is available. Although maybe it's better that nobody gets it. The responsibility behind that call is immense! The Texas thing is all three have just the call, no added suffix. I had two on cars in Texas and moved to Wyoming. The same plate on two different cars drove the clerk in the registration office over the edge. It took three hours to get new plates in Wyoming and left her shaking her head. It took three hours to get new plates in Wyoming and left her shaking her head. Well at least you weren’t asked to produce a passport from the foreign country of New Mexico, like someone from there was recently asked in Washington DC when applying for a marriage license! Some parts of New Mexico is almost like living in a foreign country. I got my NJ plates “WA2SQQ” when I got my license in 1971, I think they were $10. Still have my original embossed metal plates. When we changed to blue color I requested a new set, $3. NJ has since switched back to “straw” color,though now made of some vinyl material. I still use my blue metal plates. No yearly fee, and never had any theft. I have been stopped twice asking why I have “QQ” (antique vehicle) license plates. So now I have to explain the difference to the police officer?